Not many Campanulas that we really taking a liking to but this one is distinctly different. 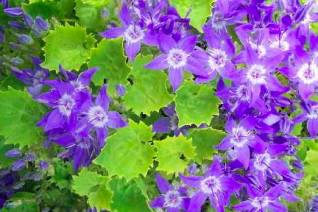 Low mounds of scintillating gold foliage become a sea of light purple/blue star shaped flowers in May-June. Part shade to shade with protection from hot sun. Rich, WELL DRAINED soil that is fertile and regular summer water. Apply a handful of organic fertilizer around it in spring- this perks up vigor and ramps up bloom. Striking plant for a shady rock garden or the front of a woodland border. A great combination of colors in one compact plant. To 5″ tall x 1′ wide in a season.